I completed my one on one research course this summer with the Director of the Nurse Practitioner program, Dr. K. I learned about the different types of research broken into two broad categories of quantitative and qualitative research. Our small school does not have the staff to support doing quantitative research with labs and statistics, so I have chosen to do qualitative grounded theory research. The topic I chose is “Coping Strategies of Caregivers of Non-Ambulatory Patients”. What a mouthful. I chose this topic largely because of my observation of how wonderfully my Dad took care of my Mom after her massive stroke. She learned to walk again slowly with a quad cane, but her left arm remained paralyzed, so he had to help her with her bath, dressing, and style her hair. I thought it was so sweet of him when he took Mom to the beautician and asked her to teach him how to use a curling iron! I don’t know of too many men who would do that. He also did all the cooking, cleaning, driving, and grocery shopping. My Mom became his full-time job which he did the last five years of her life. Thankfully, he was retired and in good health. He also traveled with her by plane and in their trailer home across the country on vacation. My Dad learned to care for my Mom after her massive stroke. During my years as a visiting nurse, I took care of a dear elderly couple. Ruth had a blood clot that went to her spine and left her paralyzed from the waist down at the age of 70. 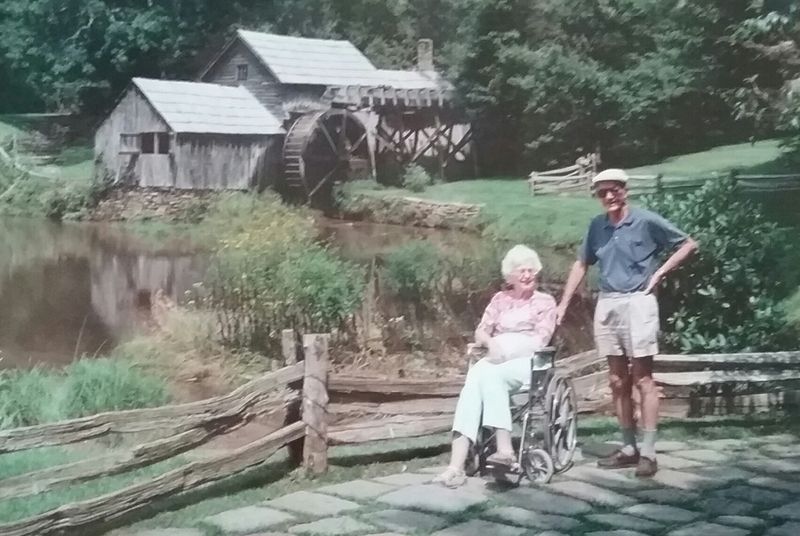 Her husband, Ray, learned to do everything for her much as my dad did, and bought a van equipped with a wheelchair lift to make it easier to transport her. Most caregivers at home are women rather than men, so I think Ray and my Dad were the exceptions. Most people would have placed people like Ruth and my Mom in a nursing home because they simply could not provide 24/7 care for them. So I asked myself, how did people cope at home with providing care for a family member who cannot walk? I noticed that when a person can’t walk, their care could become totally overwhelming. I completed my review of the literature and found an oncology nursing study with a similar theme so I will repeat it to see if I get the same results. At the Master’s level, we are not required to do original research, but only repeat what others have done to see if we get the same results. My proposal was approved by my two thesis advisors. My goal this semester is to find caregivers to interview and tape record them to gather all my data. Next semester, I will analyze the data and write my thesis. It was so nice to concentrate on nothing but research this summer and not have to work full time! I thank God for my Dad’s financial support to make this possible. Last semester was very busy, but I really enjoyed it. My clinical assignments were so interesting as I spent two full days a week working in an Internal Medicine office with two physicians. Dr. R. established his private practice about 20 years ago. He grew up in Costa Rica, so he is fluent in Spanish. He moved to the USA when he was 16 years old but still returns to Costa Rica annually to visit family there. He is a very kind gentleman and an excellent teacher. He just hired an associate, Dr. G., who recently completed his residency. Dr. G. likes to tell me all kinds of interesting stories about patients he saw during his residency. I see the patient first and take the history and do the physical exam. Then I present the patient privately to Dr. R. or Dr. G. and tell them the plan of care that I think would be best. We discuss it and they agree or disagree with me and tell me their reason so I learn how to treat the next patient with a similar problem. It is working out very well! One day, a lady who was originally from Jamaica, came to see us in near hysteria. She had coughed up a foot long worm that she put in a bottle of water to show us. I immediately recognized it as a roundworm which I had learned about when I was in the Dominican Republic. She last visited Jamaica two years ago, so it had been growing inside her all that time. Neither Dr. R. or Dr. G. had ever treated worms before, so I told them the medicine to prescribe and calmed the lady after telling her we could easily treat it. She thanked me and said she felt relieved to learn about it. It was fun to teach the teachers that day! On my third clinical day, I worked several weeks in a clinic seeing adolescents with a Pediatric NP. Rich was also an excellent teacher. The other half of the semester, I shadowed a Neonatal Intensive Care NP. I was too scared to touch the premature babies who looked so tiny and fragile in the incubators on ventilators. I watched her do a lumbar puncture on one of them where she stuck a needle gently in his spine to withdraw cerebral spinal fluid. I also watched her work in a general Pediatrician’s office. I’m just not too comfortable taking care of babies because they can’t tell me what’s wrong! I found enough caregivers to interview for my research. I tape recorded each session, then took the tapes home and played them back. Whenever the person stated a coping strategy, I stopped the tape and wrote it on an index card. After listening to all the interviews, I took all my cards and separated them into different piles of coping strategies that were repeated. I’m really enjoying doing this type of research! I completed typing my 54-page thesis and both my advisors approved the final copy. Thanks to my high school typing teacher, I didn’t need to hire a typist. Each graduate student made a poster about her research results and presented it at a reception. I was grateful for the support of all my preceptors who attended. I submitted a summary of my research to the Nurse Practitioner Journal so I will see if it is accepted for publication. God graciously opened the door for ten job interviews. After asking God for direction, I chose to work as a Family Nurse Practitioner at a psychiatric hospital. I have never worked in psychiatry before, so expect to experience a steep learning curve for at least the first six months. I will have all weekends and holidays off and am not required to take call at night since a physician stays on grounds each night. The salary is excellent, so perhaps I will be able to move from my noisy condominium to a one-story home in the future. I was so excited to finally receive my Master’s of Science in Nursing and become a Family Nurse Practitioner! I can do all things through Christ who strengthens me…But my God shall supply all your needs according to His riches in glory in Christ Jesus! Philippians 4:13, 19. The school placed a copy of each graduate student’s thesis in the school library for others to read. I praise God for carrying me through four long years of graduate school. I only had the strength to complete it because of Him. I enjoyed working as a Nurse Practitioner in a variety of roles over the next sixteen years. The Nurse Practitioner Journal published a few paragraphs about my research. and entitled it “Lending a hand to caregivers” under their Practice Pointers. Previous postContinue Graduate School or Drop Out?